iiNet has launched a new permanent installation at the venue, the iiNet Social Post deliver a digitally innovative brand experience for patrons attending events at Perth Arena. 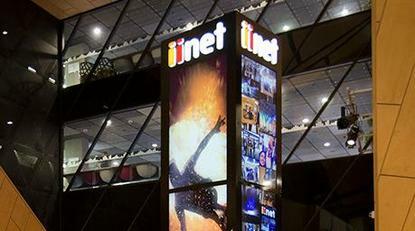 Standing at 4.6m tall, the iiNet Social Post is an interactive column equipped with 8 x 55 inch NEC commercial-grade LCD displays as well as 2 x 32 inch LCD touch screens. The column features 3D animations and a tailored social media feed with artist and fan posts powered by Australian technology company, Stackla. The Stackla feed will allow fans to engage with the column via their mobile phones, watching as their own Twitter and Instagram posts upload to the column using the hashtag #iiNetSuperFan. The best photo will become the iiNet Super Fan of the Month and win a $300 Ticketek voucher. An interactive event poll will also run on the column’s touch screens where fans can have their say and have the chance to win monthly prizes. iiNet marketing manager, Alicia Phillis, said the internet service provider is thrilled to be behind the Australia-first innovation, worked closely with local suppliers including Gettin Hectic, Marketforce, Staccato and Kingman Visual to bring the concept to life. Perth Arena General Manager Michael Scott said this innovative permanent installation demonstrates how the venue continues to lead the way in championing the fan first experience. Perth Arena opened with an unprecedented level of informative and engaging technology, including a 360 screen digital network that the venue’s founding partners have access to for targeted consumer messaging.